More than 800 million people across the globe may wake up every morning wondering if they will have enough to eat that day, according to Catholic Relief Services. One way that you can make a difference in the lives of our poorest brothers and sisters throughout the world is to become involved with CRS Rice Bowl (formerly known as Operation Rice Bowl). This Lenten program, which has been in place for more than 37 years, invites Catholics to act on their faith by helping people in need through prayer, sacrifice, solidarity and charity. Nearly 13,000 faith communities across the United States participate in the program each Lent. CRS has revamped its well-known campaign, aiming to make it more relevant for the millions it reaches each year with its themes of sacrifice and hope. CRS Rice Bowl asks that you eat a meal each week prepared with a recipe from a developing country to get a taste of the subsistence diet so many survive on. When you try these simple meatless meals, you are urged to put the money into a symbolic “rice bowl” to be donated to CRS through your parish at the end of Lent. Or you might watch a video or read a story to gain a better awareness of the hopes and dreams of those overseas. During this Lenten season, you are invited to reflect on the lives of our brothers and sisters who face poverty and hunger every day and pray with them. It is through such actions that you will come to feel solidarity with our human family, Rice Bowl organizers say. “It is not enough just to commit funds. We must also strive for new solutions to address hunger,” CRS president Carolyn Woo said in introducing the redesigned program during an online news conference last Oct. 16 marking World Food Day. “The lack of food is a threat to all aspects of society. A lack of food will hurt society at its core. It is important to remember that CRS Rice Bowl is about living our faith and doing our part to alleviate hunger both in the United States and overseas,” Woo said. “The Year of Faith asks us to renew our own faith and live and act on that faith in word and action and allow faith to become a light for ourselves and others,” she added. The Rice Bowl campaign collects about $8 million annually, with 25 percent of funds staying in local diocesan communities to fight hunger. The remaining 75 percent of the collection funds CRS anti-hunger efforts around the globe. These projects focus on initiatives that bring clean water, small enterprise development, agricultural expertise, educational opportunities, HIV/AIDS treatment and prevention, and mother/child health programs to the poor in more than 40 countries. 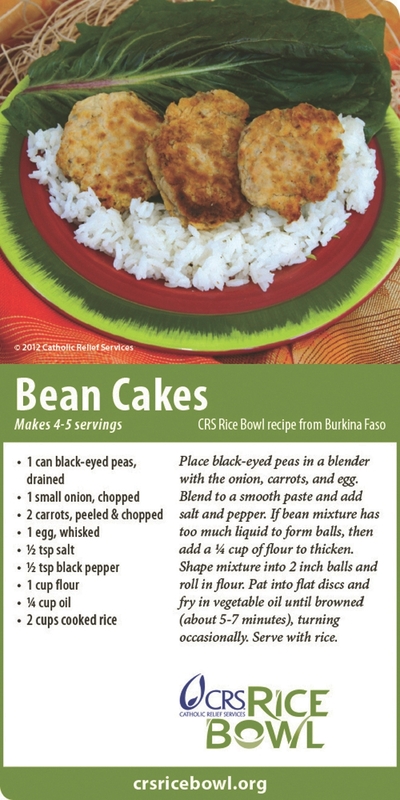 Visit crsricebowl.org to find more ideas and resources to help integrate CRS Rice Bowl into your own Lenten observances. My name is Moussa Ouedraogo and I live with my wife and seven children in Burkina Faso, a small country in West Africa. Several years ago CRS helped us set up an irrigation system in a plot of land near the village. We divided this land into small gardens for different farmers in the village. With CRS’ help we formed committees to keep our irrigation system in good repair and to manage our water and seed supplies. In my garden I grow corn and onions. I am now able to grow enough food for my family’s needs and also have produce to sell at the market. Life is much better. With the money I earned in the market, I bought two donkeys and a plow to help me farm more efficiently. I am able to send all of my children to school, and I just built a new house. Like the others in my village, I have always wanted to provide a good life for my family. With the help of CRS, this dream has come true. Father Leo Patalinghug from “Grace Before Meals” hosts a cooking show with CRS to show Catholics how to make fun, meatless meals from around the world for Lent. Visit http://www.crsricebowl.org every week for Lent. Looking for ideas and recipes for Lenten meals? Visit our Pinterest board, “Lenten Meals“.